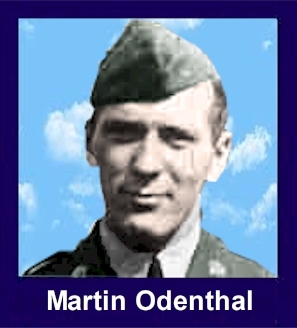 The 35th Infantry Regiment Association salutes our fallen brother, PVT Martin P. Odenthal, who died in the service of his country on January 10th, 1943 in Guadalcanal. The cause of death was listed as MIA/KIA. He was from Portage, Pennsylvania. The decorations earned by PVT Martin P. Odenthal include: the Combat Infantryman Badge, the Bronze Star, the Purple Heart, the Asiatic-Pacific Service Medal, and the World War II Victory Medal. Many soldiers go missing during wars, and much to the family's dismay, their bodies are never recovered. For the family of Private Martin Odenthal though, his body was found and brought home for a proper burial after dying in the Battle of Guadalcanal during World War II, 65 years ago. It all started on Aug. 7, 1942 when the United Sates 1st Marine Division landed on the island of Guadalcanal. The Marines quickly took over the almost completed Japanese airfield and renamed it Henderson Field. This was followed by a violent six-month long struggle with the Japanese as both sides tried to win control of the island and its precious airfield. By January 1943, the Americal and 25th Divisions of the United States Army had joined in the battle. Odenthal was a member of the L Company, which was part of the 25thy Division. Odenthal was born and raised in Portage, and he enlisted in the service at the same time as his brothers did. Albert, one of his brothers, was also in Guadalcanal. His other brother, Ralph, joined the United States Navy. The Americans wanted to move in and take over an area known as Sea Horse on Guadalcanal. It was called Sea Horse because of its shape when viewed from the air. The western slope of Sea Horse drops down to a river called Matanikau on the island. To move into position for the attack on Sea Horse, a wide flanking movement was used behind Mount Austen. The L Company moved deeper into the Jungle than any other American unit had been, and it was hard work. The thick jungle and difficult terrain made it hard for the L Company to approach Sea Horse. The Japanese were all over the island, and it was up to the Americans to clear Sea Horse of the enemy. The Americans then engaged the enemy in battle, and Odenthal went into action firing his M-1 Garrand rifle. The fighting at the battle was so fierce that two Medals of Honor, Americas highest award for bravery, were earned in the action. The Americans ended up taking the ridge, but suffered many casualties. In the six months of the struggle for Guadalcanal, more than 31,000 Japanese and 7,000 Americans died in the fighting. Odenthal was one of them. During a lull in the battle, Odenthas buddies buried him where he fell. One of his dog tags was taken to give to Graves Registration, and the other was left on Odenthal in his grave. Odenthals buddies continued fighting the enemy, and it was up to the people at Graves Registration to recover the bodies of those who have fallen. In the later search for Martin, Graves Registration failed to find the remote and deep location in the jungle. Later in the fighting, Albert also lost his life, and his body was brought home to his family. The other Odenthal brother, Ralph, was sent home when news came that his two brothers had been killed. During January 2006, a man named Sam Besi from Barana Village on Mount Austen went to Sea Horse to look for an American helmet to put on display in the village. He came upon fighting positions and foxholes and started his search. While digging, he found bones with an American dog tag and immediately reported his find to John Innes and other people in the village. Innes is a World War II historian who runs a computer business on Guadalcanal. Bessi took Innes and four others to the gravesite. After visiting the site and armed with the details from the dog tag, they used a computer to discover that the body was Odenthal, he was listed as killed in action in 1943. The computer was also used to find and contact Odenthals family. His brother Ralph and the rest of the family were amazed that he had been found. Their reaction was predictably emotional. The family did not want his remains left in the grave, they wanted him brought home. As a result of that request, a forensic team from Solomon Island Police Force was taken to the gravesite to recover the remains. A Karaka, a Maori prayer, paying respect to a spiritual presence, was offered at the gravesite. In Odenthals grave/fighting position, 35 cartridges from his rifle were found. All of them fired. The United States Army has a command based in Hawaii known as JPAC (Joint POW/MIA Accounting Command) who were notified of the discovery of Odenthal. Their duty is to find and collect remains that are found of United States service men killed in action. JPAC uses their resources to confirm the identity of remains found and return them with a full ceremony and honors to the family of those killed..
Odenthal finally began his journey home. He was sent to JPAC so they could prepare his final homecoming to his family. His departure was not anonymous and unrecognized. A contingent of the Solomon Island Police and military from RAMSI were there to pay respects in a commercial farewell to a fallen warrior and hero of the Battle of Guadalcanal. Odenthal had his funeral on December 18, 2007 in the McKeesport area.